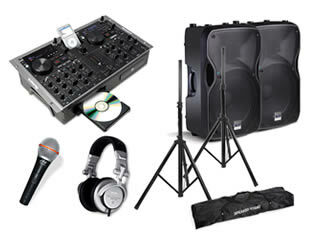 For those not familiar with disco and PA equipment and for ease and value, we offer basic playback and PA packages with all the necessary equipment to run your party, karaoke evening, conference or presentation, as well as add-on lighting packages on the following page. 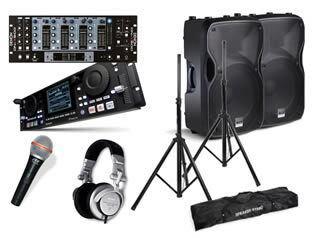 In addition we also offer packages for more advanced users wanting to hire professional quality equipment. Special rates apply for packages which are supplied for a period of a weekend, bank holiday or two days rather than just a single day at approximately the same rate as the major individual components would cost on a daily rental basis (however additional daily rate charges for the individual components still apply if not returned by the due date). This should give you the opportunity to practice and become familiar with the equipment before the event. Please note that you will required at least a small to medium sized family hatch-back to collect the disco or karaoke based systems, particularly if you opt for any add-ons or lighting packages. Further information on what might be most suitable for your party can be found on our “Help Choosing Speakers” page. 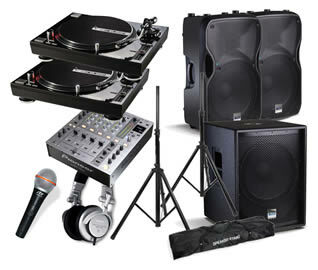 We are also happy to offer advice and suggestions as to suitable options to enhance your set-up. You can, of course, choose anything from the individual items available for hire to tailor your evening as you wish. Details of the components supplied in each package can be found on the relevant pages for each type of item. Ideal for those just wishing to run a playlist from an iPod, phone, mp3 player or laptop but not have the control of being to be able to select music on the fly. Suitable for audiences of up to about 110 guests in a medium sized house to a medium sized hall playing regular party music. Requires 1 x 13 amp socket. All the necessary power cables and speaker connections. Please note that there is no iPod or any other player included. This must be supplied by the renter. Powered sub-woofer (Alto Professional Truesonic TSSub15A or similar) to add extra bass response to extend coverage for up to 160 guests playing standard party music or for up to 110 guests playing bass-heavy dance music. Requires an additional 1 x 13amp socket. 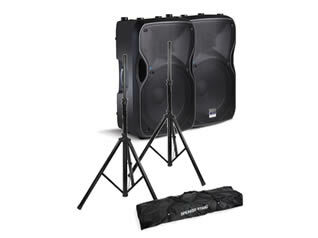 Two sub-woofers as above, suitable for up to 200 guests at a standard party or 150 for bass heavy music. Ideal if you require a similar sound package to the standard but have a limited space in which to put it or want a more discreet option. The Nano has remarkable quality and level of sound, particularly bass, considering the diminutive form of this package, which can be configured in mono and stereo. Suitable for audiences of up to about 100 guests in a small to large sized house to a small sized hall playing standard party music. Requires 1 x 13 amp socket. This package swaps out 12” speakers for higher output 15” models, giving significantly improved bass extension as well as more volume. Suitable for audiences of up to about 140 guests in a large sized house to a medium to large sized hall playing standard party music, or up to 90 guests playing bass heavy-dance music. Requires 1 x 13 amp socket. A high quality system that looks as good as it sounds, this package includes either one or two FBT Vertus CS-1000 systems in an elegant white finish to blend in with wedding festivities and décor. This does not compromise the sound quality at all, however, as the powerful system sounds really controlled and incredibly sweet even at high volumes. Optionally we can also supply CDJ or turntables to add to the system. A single system is suitable for audiences up to 80 to 100 people indoors. 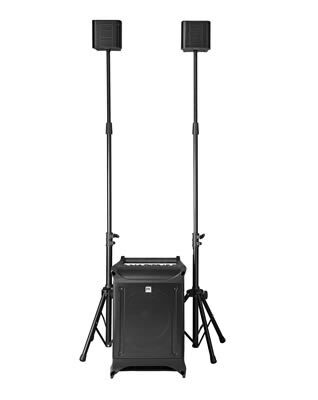 Twin systems are suitable for audiences up to 200 people indoors. Requires 1 x 13 amp socket. Pioneer CDJ850 pair and DJM700 mixer. Pioneer CDJ2000NXS 2 pair and DJM900NXS2 mixer. For those looking for better sound quality and louder output than available from the Standard package, you need look no further than our Superior package. It is still ideal for those wishing to run a playlist from an iPod, phone, mp3 player or laptop but has additional connectivity on the control panel making connecting additional devices and microphones a breeze without the need for a mixer. Suitable for audiences of up to about 170 guests in a large house to a medium to large sized hall playing regular party music. Requires 1 x 13 amp socket. Powered sub-woofer (Yamaha DXS12) to add extra bass response to extend coverage for up to 200 guests playing standard party music or for up to 170 guests playing bass-heavy dance music. Requires an additional 1 x 13amp socket. 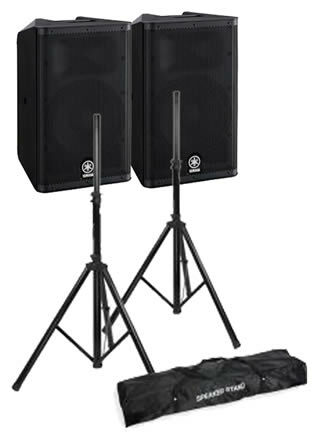 Two sub-woofers as above, suitable for up to 250 guests at a standard party or 200 for bass heavy music. This package supplies everything you need to run your own disco in a venue from the size of a large house to a medium sized hall for up to 110 guests. From it you can play and mix CDs from the two decks and an iPod from the included dock or another mp3 or line based source through the inputs. All you need do is supply the music! Requires 2 x 13 amp sockets. 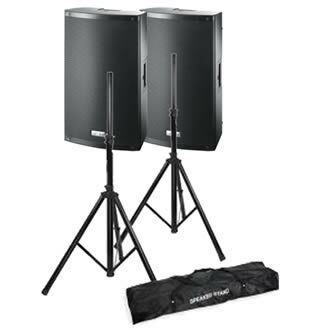 Premium quality space-saving 10”speakers for parties where room is limited. 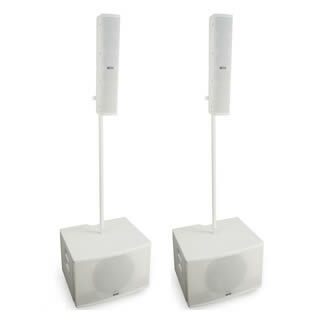 These, however, are more powerful and of a higher quality but with marginally less bass response than 12” speakers above. Still suitable for up to 120 guests in a small house to medium hall. They are also supplied with one wired microphone which can be mixed directly from the speakers. Karaoke multi-media player add-on, supplied with two wired microphones (no Karaoke discs or monitor supplied – you will need to supply your own karaoke songs and TV or monitor. We can supply these as extras – see the relevant pages or ask for pricing). This package is similar to the standard disco package, but swaps the CD and iPod based system for one that will play mp3 or other digital files from USB thumb drives or externally powered USB hard drives. It comes with a professional style mixer to which you can also connect other external devices. Requires 1 x 13 amp socket. Karaoke multi-media player add-on, supplied with two wired microphones. This will also add CD playout capability to the system (no Karaoke discs or monitor supplied – you will need to supply your own karaoke songs and TV or monitor). 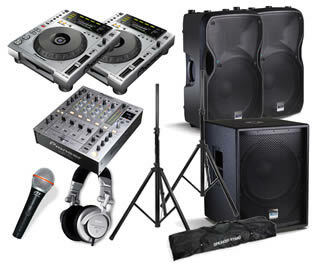 This package is for serious DJs wanting to display their mixing skills to a medium to large audience. It combines industry standard CDJ players and a club mixer with a powerful 1.4k PA system suitable for audience of up to 160 people in medium to large halls. Requires 2 x 13amp sockets. Further powered 15” sub-woofer to match. Requires further 13 amp socket. Upgrade to Pioneer CDJ2000NXS2 players & DJM900NXS2 mixer. Swapping CDJs for vinyl turntables, this package is for traditional DJs preferring to mix or scratch directly or via time-coded vinyl (not supplied) to a medium to large audience. It combines high end modern vinyl turntables (modern equivalent to the now discontinued classic Technics SL1210) and a club mixer with a powerful 1.4k PA system suitable for audience of up to 200 people in medium to large halls. Options are available to add a pair of CDJs. Requires 2 x 13amp sockets. Further powered 15” sub-woofer to match. Pair of CDJ players (Pioneer CDJ850 or equivalent). Larger, premium quality PA systems for bigger audiences are available. 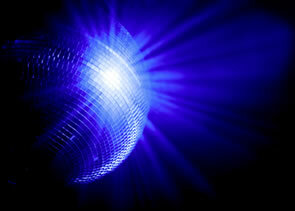 Details can be found on the PA, Live and Disco Speakers page. Please ask for upgrade costs.